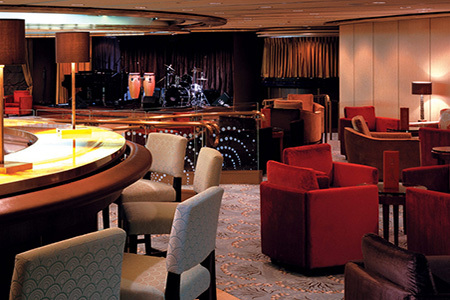 The Avenue Saloon is one of the ship's most popular venues. The piano bar retains its 19th-century gentlemen's club feel with rich mahogany woods, buttery leathers, and luxe velvets. 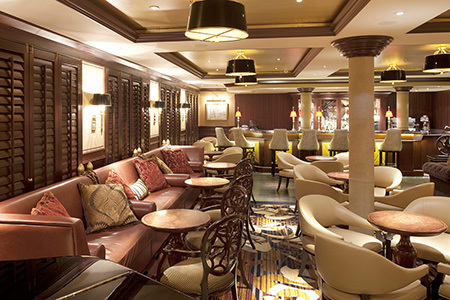 Seating areas include embossed-leaf barstools, brass-tack couches, and tufted booths, while romantic lighting, antique-style trunk tables, custom artwork, and audio systems add to the salon's inviting ambiance. 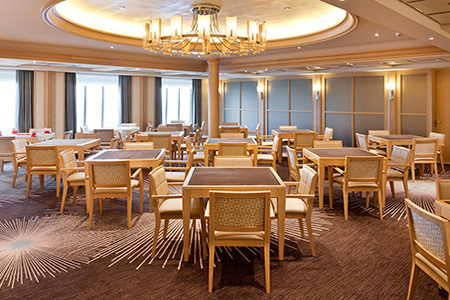 Reminiscent of the Gilded Age's tennis and card clubs, the Bridge Lounge boasts ambient sconces, floor-to-ceiling drapes, Roman sheers, and a 12K gold, champagne leaf dome ceiling, as well as game tables and state-of-the-art audio/visual tools. 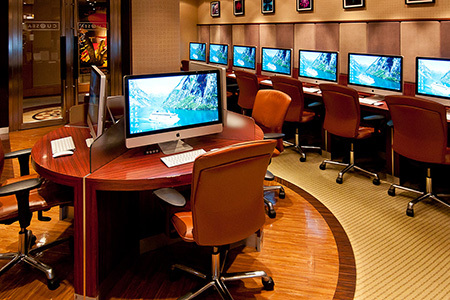 The popular Computer University@Sea program is offered on all cruises. CU@Sea provides e-mail services, internet access, and extensive enrichment course offerings. Create a website about your worldly adventures. Send emails back home, or simply learn the basic technology. Its all possible at Computer University@Sea. 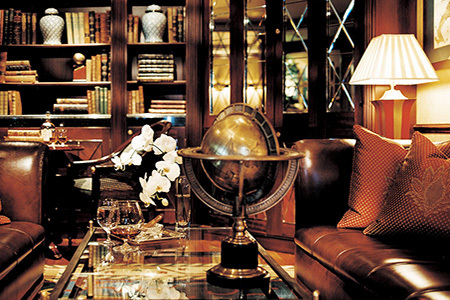 Whether you prefer a Monte Cristo or Davidoff with your Courvoisier, your every wish is indulged in the exclusive yet welcoming atmosphere of the intimate Connoisseur Club. Fresh mango, muddled raspberries or a zest of ginger. 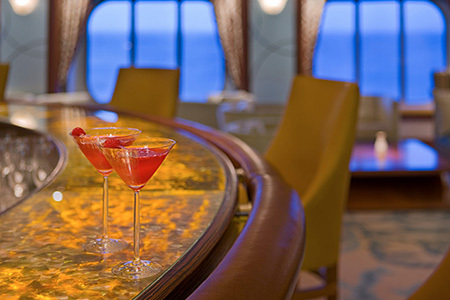 Savor a custom-blended cocktail at the Crystal Cove bar, where something as seemingly simple as an aperitif becomes a stellar event unto itself. 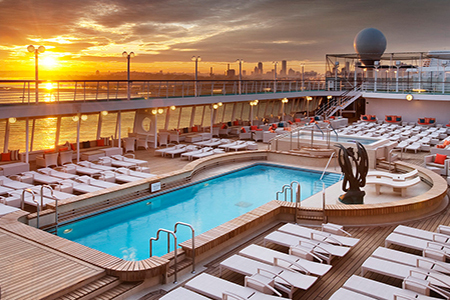 Melt into the sublime comforts of the only Feng Shui-inspired spa at sea, repeatedly voted the World's Best, where you'll appreciate the perfect balance of pampering relaxation. 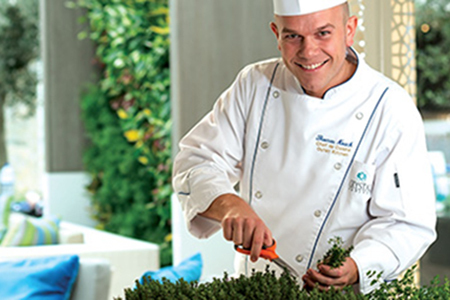 Blending ancient therapies with modern-day philosophies, mind, body and soul are restored with pampered perfection. The pivotal public area is the Crystal Plaza, Crystal Symphony's central, two story atrium lobby, with a water sculpture descending from the skylight ceiling to the marble floor. 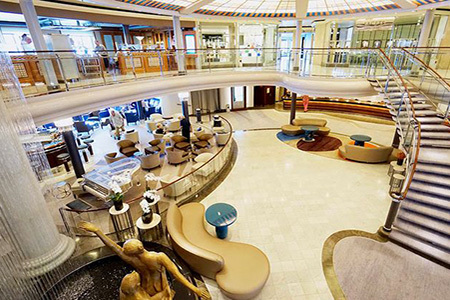 Circling the top level of the atrium on Deck 6 are the shops of Symphony's "Avenue of the Stars" shopping arcade; along with the Bistro, an airy wine, cheese, and espresso lounge. 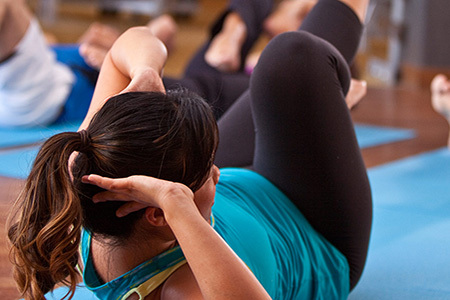 Find harmony and strength with yoga, Pilates and other chi-balancing classes offered in the state-of-the-art Fitness Center. The Kinesis (TM) fitness equipment in the Fitness Center capitalizes on the use of cable resistance in all planes of movement, and simultaneously incorporates several areas of fitness: strength, flexibility and balance. The Galaxy Lounge is the venue for award-winning production shows and a host of other evening performances. The showroom was custom-designed to offer perfect views from each of its seats, and features state-of-the-art sound and lighting systems. With a look inspired by classic, Art Deco movie palaces, the Hollywood Theater features custom-woven acoustic wall paneling and velvet curtains. 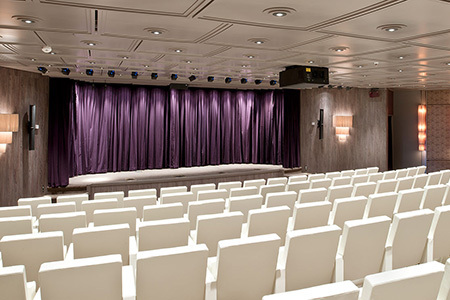 Bose and Meyer audio systems and Barco projectors enhance the experience. Marketplace is a gorgeous social space for dining and conversation by day, and a Brazilian steakhouse, Churrascaria, by night. 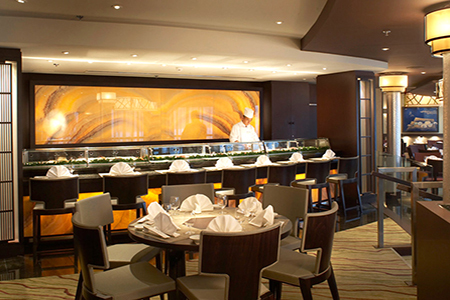 During the day, enjoy a fresh and friendly venue with an open kitchen. In the evening, enjoy a taste of South America with a feast of succulent cuts of meat and ceviches. 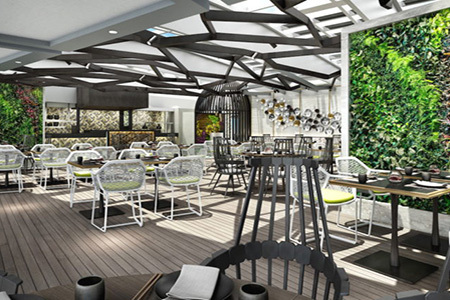 The Palm Court recalls the glamour-filled Coconut Grove of Hollywood's yesteryear with an ultra-contemporary flair. Sparkling as the crown jewel atop the ship, enjoy the late-day sun as it streams through Palm Court's dramatic wall of windows. This Venetian-designed Italian restaurant, showcases the cuisine of Piero Selvaggio. Prego is available by reservation only and features classic Italian dishes served in an intimate setting. Probably the most famous dish served in Prego is the creamy mushroom soup - full of several different types of Italian mushrooms served in an oregano bread bowl. 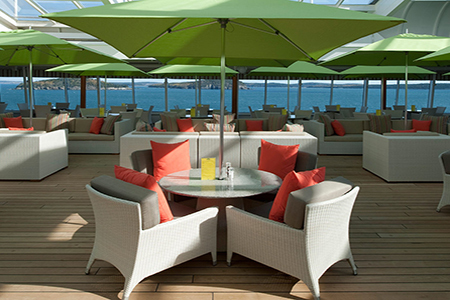 The 360-degree teak Promenade offers breathtaking vistas witnessed only at sea. 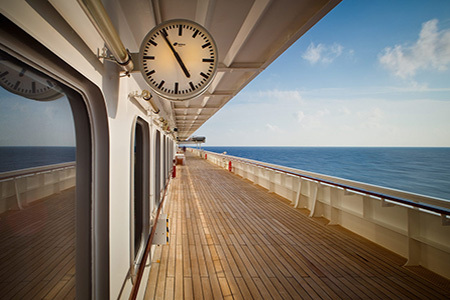 To walk along the Promenade deck is to truly experience one of the greatest moments of ocean travel. 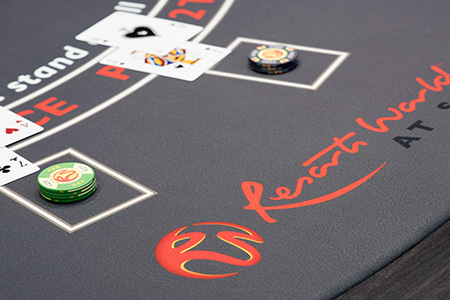 Excitement fills the air as your senses tingle amidst the casino's electrifying energy. You can't believe your luck as you discover thrilling games of chance aboard your Crystal ship's Resorts World At Sea casino. Surrounded by teak decking, the extra-large Jacuzzi hot tub at the Seahorse Pool includes a special water feature. Crisp white deck furniture and inviting sunbeds offer added seating for al fresco dining and relaxing around the Seahorse Pool. Chinese-inspired al fresco dining is available at Silk, one of two onboard restaurants by world-class master chef Nobuyuki "Nobu" Matsuhisa. Silk offers a variety of delicacies such as dumplings, porridge, and savory crepes for breakfast, and favorites such as dim sum, noodles and soups for lunch. The dinner menu features tantalizing family-style sharing plates. Open-seating for breakfast and lunch; dinner reservations recommended. Dancing and laughing. Reminiscing and discovering. 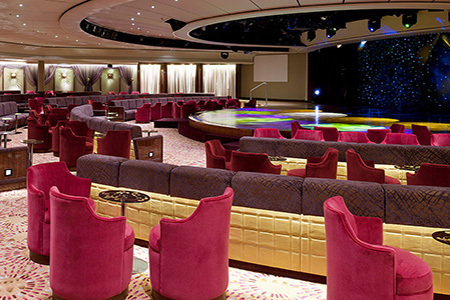 The Starlite Club shines each evening with intimate cabaret performances, dancing and moments of carefree happiness. 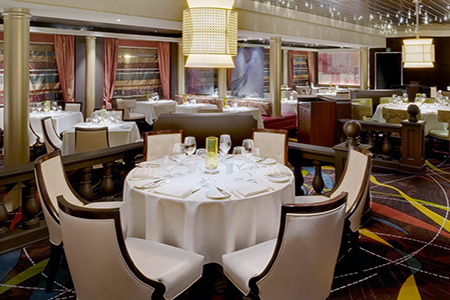 The Vintage Room is a unique venue that promotes wine appreciation and the vast range of wine selections offered on board. 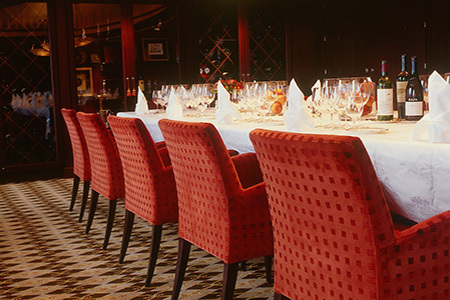 This enrichment experience focuses on wine, with food specially prepared and paired to complement the specific fine wines selected for the evening. In the cool light of early evening, dine alfresco with newfound friends at Trident Grill enjoying delicacies such as Tandoori beef, grilled prawns on lemongrass, or a classic Caesar with chicken. 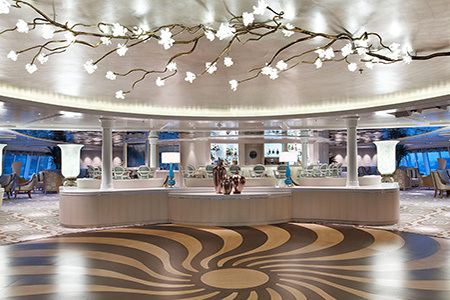 World-class master chef Nobuyuki "Nobu" Matsuhisa has partnered with Crystal Cruises to create Umi Uma and Sushi Bar. Internationally known for the innovative blend of classically styled Japanese foods with distinct Peruvian and European influences, Nobu-trained chefs showcase popular specialties at Umi Uma and Sushi Bar, including yellowtail sashimi with jalapeo and tuna tataki with ponzu sauce. Waterside (formerly Crystal Dining Room) serves breakfast, lunch and dinner, with an abundance of tables for two and four. 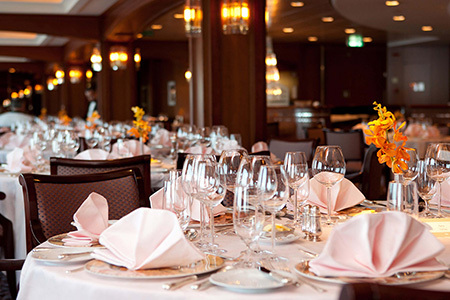 The menu includes classic favorites and a selection of progressive Modern Cuisine specialties. Open seating, no reservations are required. Waves, is the teens only hang-out. Fantasia is a play area for younger kids. 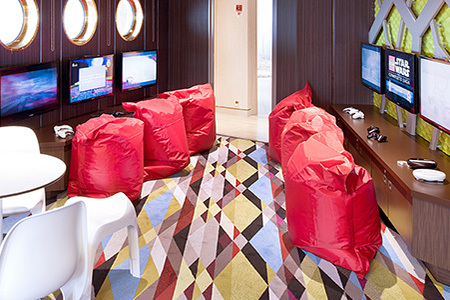 All can enjoy Wii, PlayStation, Xbox, Kinect, wide-screen TVs, and supervised age-specific activities. 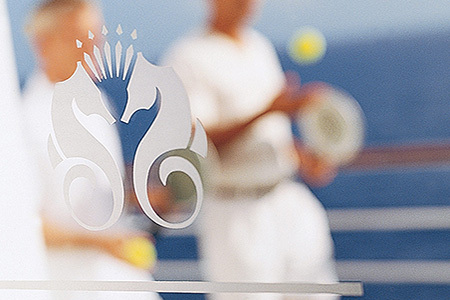 High above the sea, where warm rays of sunshine meet cool ocean breezes, Wimbledon Court welcomes doubles and singles matches.